Christmas is almost upon us, and it would be somewhat unusual for Electric Jive not to welcome in the festive season without providing our readers with a hefty dose of mbaqanga. Therefore, I am proud to present the first of a two-part compilation entitled A Mavuthela Christmas. 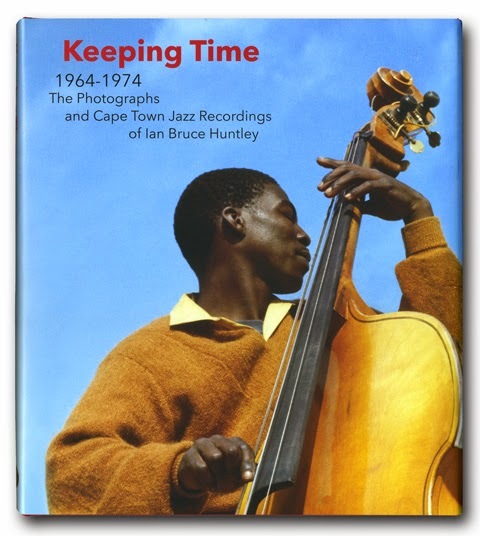 This is the fifth volume in my series charting the music of the Mavuthela Music Company, a series that began back in 2009 with a post on the Matsuli Music blog. 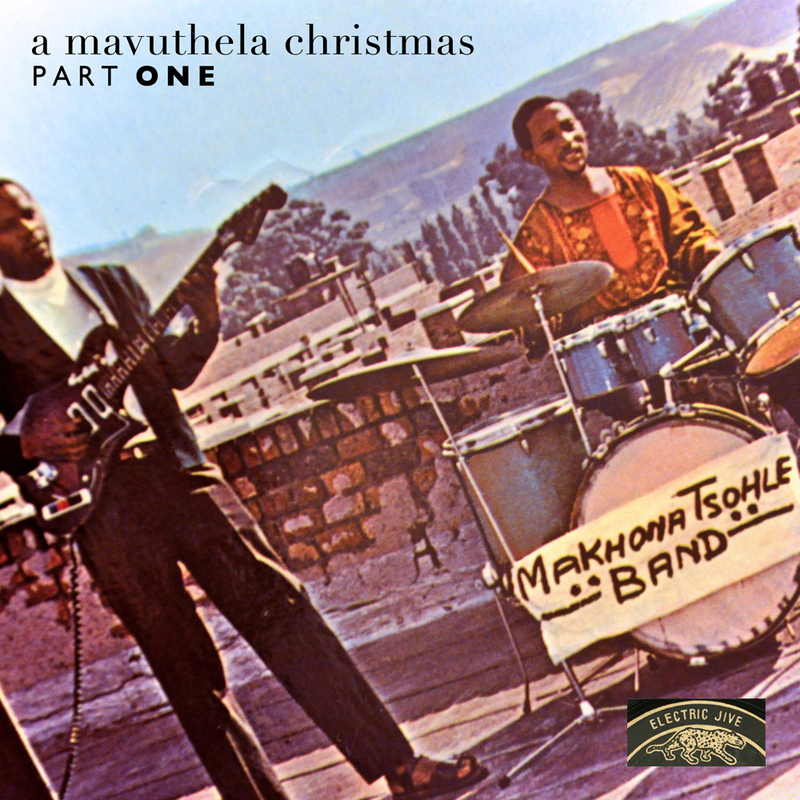 A Mavuthela Christmas – Part One pays tribute to the glue that held everything together. That glue was a tight unit of instrumentalists who not only provided beautiful musical backing for the vocal stars, but also created their own wonderful melodic hits. This compilation traces not only some of the most rhythmic sax jive recordings of the company, but also some of the unusual ventures into others music styles such as ska, soul, the keyboard-led marabi, and the mid-1970s “African Jazz” revival. All in all, this mixture of recordings provides something of a peek into what made the Mavuthela instrumental section the supreme, creative and talented powerhouse it was. At Mavuthela’s start, the musical backing was provided mostly by former pennywhistle jive stars who had been forced to learn newer instruments – these included Jerry Mlotshwa on electric lead guitar, Lucky Monama and Jerry Mthethwa on acoustic rhythm guitar, Ben Nkosi on string bass and Wilfred Mosebi on drums. Reggie Msomi, who had been pushed out of his Gallo producing role when Rupert Bopape was recruited to start up the Mavuthela division, also provided electric guitar and saxophone harmonies. The early Mavuthela sax jive material made for pleasant listening, but it was nothing revolutionary, rather it was Bopape carrying on at Gallo from where he had left off at EMI. Thankfully, the Mavuthela team was boosted by the arrivals of three key individuals. These were Marks Mankwane on electric lead guitar, Joseph Makwela on electric bass and Vivian Ngubane on electric rhythm guitar. With their appointments, the new harder-edged mbaqanga sound became a staple of the industry. Mankwane, Makwela, Ngubane and Monama (now on drums, replacing Wilfred Mosebi) formed the nucleus of the new Mavuthela house band, which was later named the Makgona Tsohle Band in about 1965. Makgona Tsohle backed the company’s top artists including Mahlathini, the Mahotella Queens, the Mthunzini Girls, and many others, as well as the saxophone stars such as West Nkosi, Reggie Msomi, Spokes Mashiyane, Lemmy ‘Special’ Mabaso, Mario Da Conceicao and many others. The Makgona Tsohle Band – West Nkosi combination was a popular one. The combination of elastic guitar rhythm with the screaming alto sax was irresistible to audiences of the day. The material was released across a number of different pseudonyms, including Marks Mankwane and His Band, West Nkosi and His Sax, Joseph Makwela and His Comrades or Lucky Monama and His Partners – usually depending on which member had composed the tune, or led the music in the recording. The name that gained currency was, of course, the Makgona Tsohle Band, a Sesotho term loosely translating to “the band that can do anything”. It was a literal statement, for the team could easily move from sax jive to soul or ska, infused with that classic Makgona Tsohle sound. All of these examples are represented in the compilation. There was also a mushrooming collection of “junior” members who formed small bands and released some successful material. It was an active training ground to prepare them for the stardom they would encounter later in their careers at Mavuthela. Abafana Be Mvunge was a team of musicians that arose in the later 1960s, showcasing the best of the more second-tier members such as Nathaniel Mthembu on lead guitar (who later went to Hamilton Nzimande’s Isibaya Esikhulu team at CBS-GRC) and Sipho Bhengu on alto sax. It was an energetic session group, and their material was always extremely infectious and enjoyable. During the early 1970s, the Marabi Kings – who also recorded under the name Abafana Bamarabi – was another popular group comprised of more junior members like Marubini Jagome on lead guitar, Christian Nombewu on rhythm guitar, Sipho Mthethwa on bass and Eddie Ndzeru on drums. The Big Bag Boys, on the other hand, appeared to be a group that mixed musicians from right across the board. They were in fact named after a hugely successful 1967 single titled “Big Bag No. 1”, recorded by the Makgona Tsohle Band. The Mavuthela instrumental team was lucky enough to be supported by Shadrack Piliso, a former trumpet player whose unique ear for music and talent for songwriting helped to create many, many pop hits for the company. He was the vocal arranger for most of the girl group material, and also came up with a lot of the melodies for sax jive songs. Piliso also contributed to recordings as a keyboard player when soul music became popular in South Africa, and his group – S. Piliso and His Super Seven – focused on creating indigenous cover recordings of American soul hits. He also worked up a brief “marabi revival” in the early 1970s, bringing the pedal organ into the Gallo studios and playing it alongside the guitar-led band. In 1975, when Mavuthela decided it needed to branch out into the bump jive sound already being made popular by the likes of producer David Thekwane over at Teal Records, Piliso became leader of the “African Jazz” group The Members, which also featured his younger brother Edmund ‘Ntemi’ Piliso on soprano/alto/tenor sax, Ellison Themba on tenor sax and Aaron Lebona on piano, alongside Lemmy 'Special' Mabaso on alto sax and Roger Xezu on tenor sax - all backed by younger blood such as Boxer Kheswa on rhythm guitar, Jerry Mlotshwa on bass guitar and Zeph Khoza on drums. 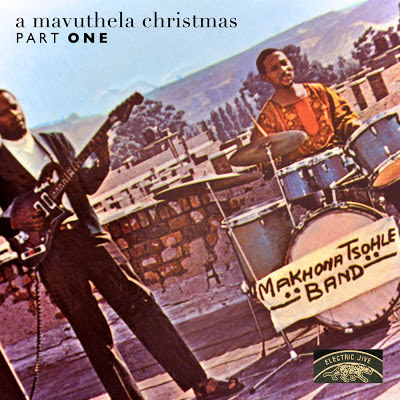 A Mavuthela Christmas – Part Two will be posted later in the week, and will focus on classic female and male vocal jive recordings. In the meantime, I hope you enjoy this mixed bag of instrumental goodies. Many of them are simply beautiful pieces of works, and all are a complete joy to listen to. nice post it is which regards to Christmas music station. thanks for share this. Christmas isn't complete without fondly remembering West and his mouth organ. Bless you, Santa Nick. What a commentary - I love the depth of the insights you always give! I would like to thank Nick very much for his in-depth researches into the music that he presents here. I have been a follower of the groups that he has presented here and all the information is correct and factual. The music is found nowhere except here although Nick is always removing the download links before we can benefit. Please allow us to download whether or not there have been many downloads< God will bless you. I appreciate the expenses you bear in providing this music and its your passion too. God bless you Nick.